Celest Thoi Goes to Tokyo! Some time back, in February, you might have noticed my abrupt disappearance for a few days. No kidnap attempt of any sort, I was actually accompanying my husband for one of his most favourite pastime – running marathons! Now, most of us would be thrilled to just take part in the local Standard Chartered Marathon (coming up soon), or the Adidas King of the Road Run (in good ol’ KL), but no, that wouldn’t do it for James. Fueled by his passion for putting one foot in front of the other in an endless loop, he signed up for one of the major marathons of the world – all the way in Tokyo. 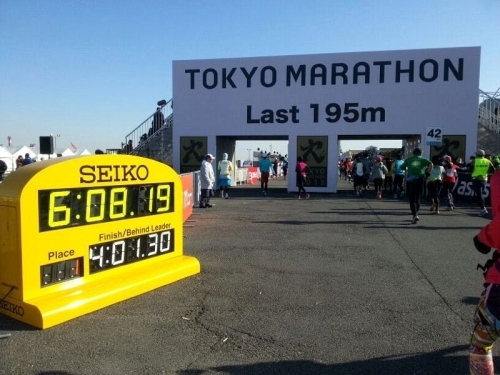 The Tokyo Marathon is a highly exclusive event, with only 30,000 participants chosen out of the annual 300,000 that try to register for it. Thats about a 10% success rate, and normally, you’d have more chance of seeing an elephant cycling down the street than actually making it into the race. Well, I didn’t see any cycling elephants, but guess what? My husband managed to get himself registered, and before we knew it, we were in the Land of the Rising Sun. 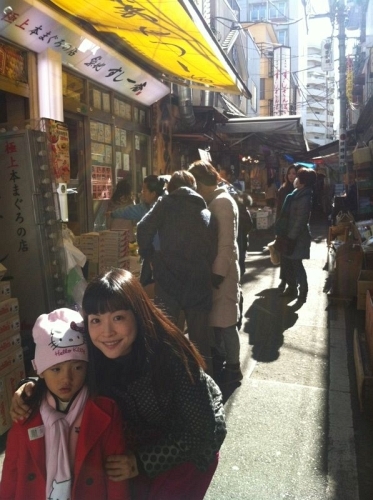 Having been to Tokyo more than 10 years back, I was beside myself with excitement, and had a whole list of things to do when were over there. My husband? Entirely focused on running the race. I could barely get him to pay attention when we were packing for the trip! Before we (or at least I) knew it, were were on board the plane with our little girl, and on our way to Tokyo! 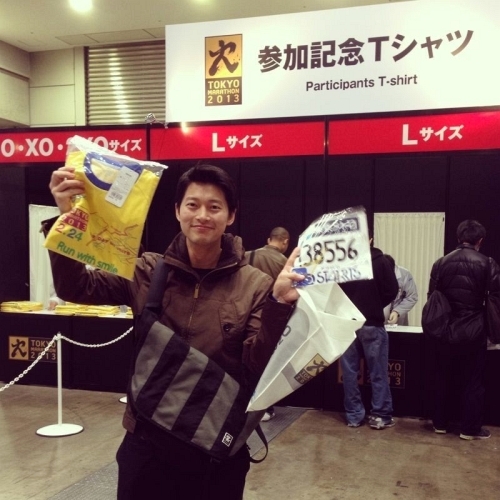 Here is the hubby, collecting the runner’s shirt and bib. He is rarely happier than during moments like these. One significant difference between our local marathons and this particular one would be the weather. In Malaysia, wearing anything other than the thinnest running vest would probably cause a runner to collapse within seconds in the heat. Over here, however, the cold weather permitted the runners to be, well, a little more… creative. 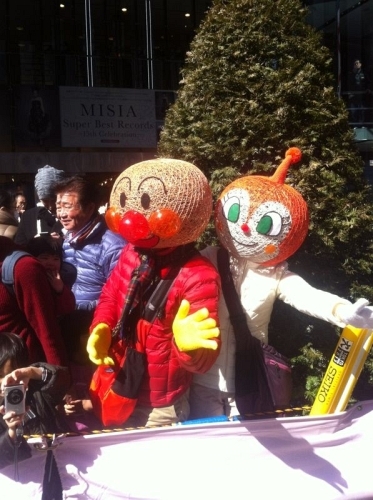 Say hello to Japanese icons – Anpanman and friend. 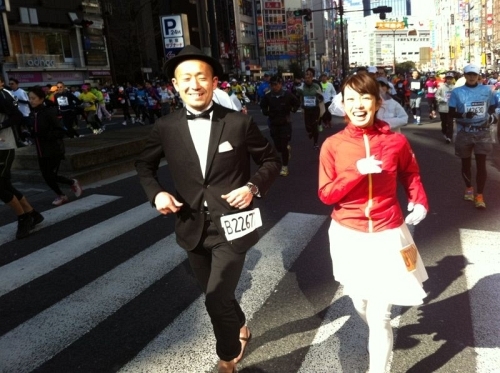 Look at this couple, how sweet they are to dress up in “wedding attire” and running together! 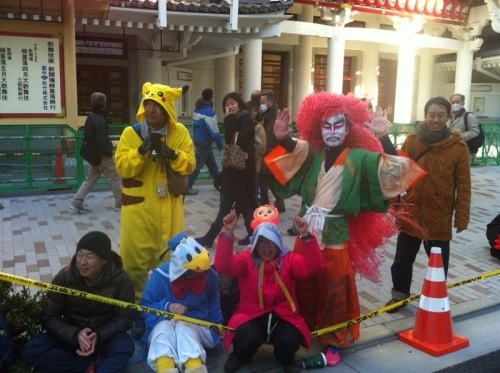 And here, Donald Duck hanging out with Pokemon, and a deranged Kabuki clown hell-bent on killing anyone within reach. Since James was away for a bit, my natural instinct took over, and I found myself on Fabric Street, where textiles abound! 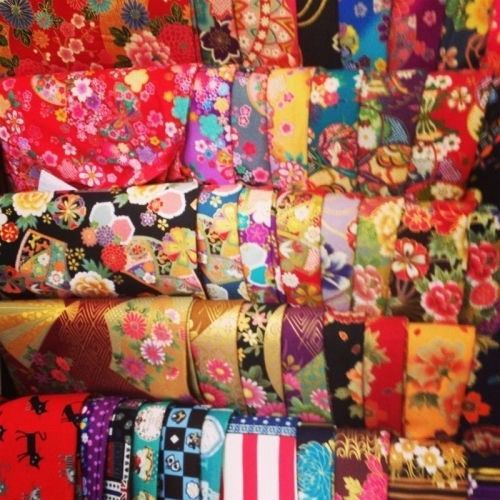 Wandering about, I found, to my joy, plenty of cloth and material that I could use for my designs back home. Kimonos abound, and the instinctive designer spirit in me immediately began to piece together designs that would fully utilize these things. Most of the designs here, I must say, lean towards the cute, kawaii styles that the Japanese favor. The gowns here are very reminiscent of princesses- fairy tale designs that are incredibly elaborate and magically whimsical. I feel that our local flavor has grown past that, where we are now more into figure-hugging, simplistic designs. Still, that didn’t stop me from cracking my head to see what I could bring back to Malaysia from here! A word of advice though; these things here aren’t cheap. While the fabric may be rather reasonable, some of the accessories are quite highly priced. 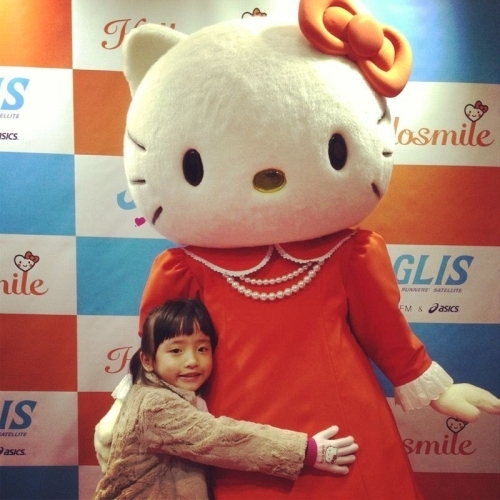 My daughter, with one of her favourite Sanrio characters…Hello Kitty!! Look out for this sign: It means you’ve arrived at Fabric Town. Meanwhile, back at the run, James was huffing and puffing away in the blistering cold, half wishing for the warmer climate of Malaysia. Alongside him, in all manner of dress, 2,999 other people chugged away with wisps of breath misting in the cold weather. 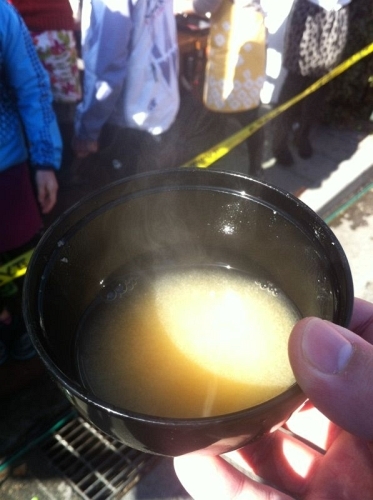 To his pleasant surprise, along the way, volunteers were handing out bowls of hot miso soup! These were served alongside servings of food for those weary runners about to collapse from exhaustion. Miso soup: Like a cold beer to a man dying of thirst. The final marker.. You won’t believe what a sight for sore eyes (and sore feet) it was. After an ardous 6 hours, the exhausted hubby completed his run. 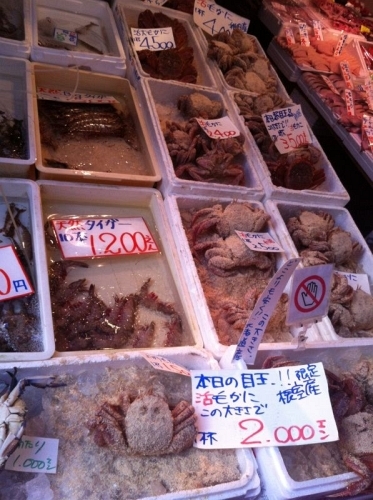 Despite his obvious tiredness, the next morning, he was still game enough to visit the world-reknown Tsukiji market – one of the most amazing places I have ever been to! You know how you enjoy that slab of sushi over at our local Japanese eateries? If you like how fresh that fish tastes, well, you’re going to certainly fall head over heels for this place. As the biggest wholesale fish market and seafood market in the world, there is definitely no shortage of raw, fresh seafood to be had. 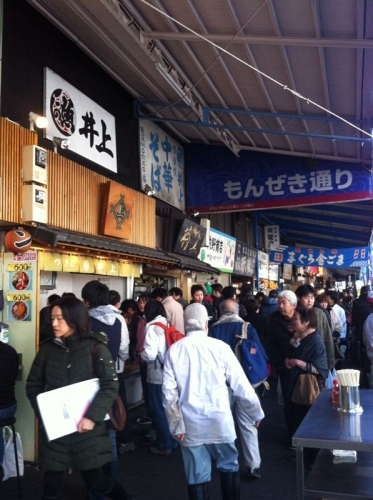 Salmon, unagi, and a hundred other variants of aquatic life are marketed through this busy district, and we just couldn’t give up the chance to sample some of the fine offerings! This is incredibly early in the morning, and people are already at their peak, rushing about with their deliveries. Here I am, with a slightly disinterested daughter. She must be thinking about the Hello Kitty. What do I think about the trip? Well, suffice to say, food was never an issue (a confession: I absolutely adore Japanese food) and there was an (over)abundance of sinfully tempting dishes to try out. As for the fashion side of things, my tastes still run towards our local (and more minimalistic) designs, but hey, who knows what will be the next big thing? And finally, I think what tops the day off would be the friendly and courteous citizens of Tokyo, who somehow made the entire place seem like a incredibly safe place to visit. I would have no qualms walking along the streets alone at night over here! A short, but decidedly exciting trip. Can’t wait for the next round of sashimi!